If, as mentioned above, scholasticism continued to flourish, the Italian humanists (i.e., lovers and practitioners of the humanities) challenged its supremacy. As we have seen, they believed that philosophy could be brought under the wing of rhetoric. They also thought that the scholarly discourse of their time needed to return to the elegance and precision of its classical models. They therefore tried dressing philosophy in a more appealing garb than had their predecessors, whose translations and commentaries were in technical Latin and sometimes simply transliterated the Greek. In 1416/1417 Leonardo Bruni, the pre-eminent humanist of his time and chancellor of Florence, re-translated Aristotle's Ethics into a more flowing, idiomatic and classical Latin. He hoped to communicate the elegance of Aristotle's Greek while also making the text more accessible to those without a philosophical education. Others, including Nicolò Tignosi in Florence around 1460, and the Frenchman Jacques Lefèvre d'Étaples in Paris in the 1490s, tried to please the humanists either by including in their commentaries on Aristotle appealing historical examples or quotations from poetry, or by avoiding the standard scholastic format of questions, or both. The driving conviction was that philosophy should be freed of its technical jargon so that more people would be able to read it. At the same time, all kinds of summaries, paraphrases, and dialogues dealing with philosophical issues were prepared, in order to give their topics a wider dissemination. 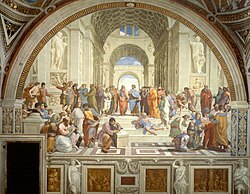 Humanists also encouraged the study of Aristotle and other writers of antiquity in the original. Desiderius Erasmus, the great Dutch humanist, even prepared a Greek ion of Aristotle, and eventually those teaching philosophy in the universities had to at least pretend that they knew Greek. Humanists were not, however, great fans of the vernacular. There is only a handful of examples of dialogues or translations of Aristotle's works into Italian during the fifteenth century. Once it had been determined, however, that Italian was a language with literary merit and that it could carry the weight of philosophical discussion, numerous efforts in this direction started to appear, particularly from the 1540s onward. Alessandro Piccolomini had a programme to translate or paraphrase the entire Aristotelian corpus into the vernacular. Other important figures were Benedetto Varchi, Bernardo Segni and Giambattista Gelli, all of them active in Florence. Efforts got underway to present Plato's doctrines in the vernacular as well. This rise of vernacular philosophy, which quite predated the Cartesian approach, is a new field of research whose contours are only now beginning to be clarified.